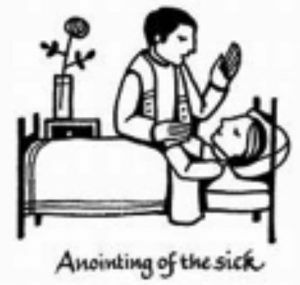 When a relative or friend is unwell it can be a great comfort for them to receive a visit from the Parish, whether it be the Parish Priest himself or a member of the SVP or the Legion of Mary; also some of our Extraordinary Ministers of Holy Communion take the Blessed Sacrament to people’s homes. We care about our Parishioners and want them to know that they are not forgotten. If someone does fall ill, please let the Parish Office know on 01642 806469 or send us a message – please do not assume that the Parish Priest is aware. If a relative or friend is moved to a residential care home or nursing home, please let the Parish Office know on 01642 806469 or send us a message – please do not assume that the Parish Priest is aware. When someone has to go into hospital and they need an EMERGENCY VISIT from a priest, an on-call priest from within the Partnership area is available 7 days a week; ring 01642 617617 and ask for him to be bleeped. Please do not use this number for routine visits.